NOLA Coffee: with Chicory or Bitters? | Season It Already! Posted on March 10, 2015 by Carrie @ Season It Already! A trip to New Orleans is never complete without trying a couple of beignets. Beignets are pillowy doughnuts doused with powdered sugar. Don’t breathe when you take a bite or you will blow that sugary goodness everywhere! This was Rob’s first trip to New Orleans. He was sure that he would find beignets to be overrated; but after one bite, his face lit up. Yes, there is something special about these! I personally like the ones over at Café Beignet a tad better. 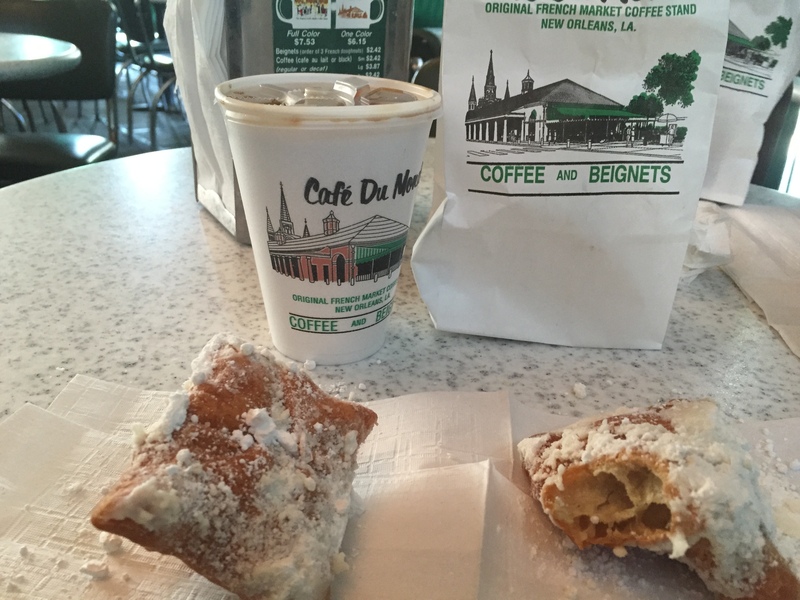 But Rob is a Café du Monde purist. Almost everywhere you go in New Orleans, when you order coffee, it’s chicory coffee that you’ll be served. The addition of chicory to the coffee blend was originally used to stretch coffee during hard times. Chicory adds a stronger, more bitter taste to the coffee. I like it. Our friend Javad, who currently lives in New Orleans said to me, “You like that stuff?! It tastes like dirt!” So Rob made up his mind that he didn’t like chicory coffee before he even tried it. Or at least when he tasted it, he was already looking for that “dirt” flavor. If it’s a little too strong or bitter for you, you can always order a café au lait instead. The added milk will tame it down and give it a bit of creaminess. Then there is PJ’s Coffee, which is sort of the Starbucks of New Orleans. You’ll find the franchised New Orleans coffee shop all over the city. However, it’s unclear to me if the coffee you’d get here is the chicory kind. Before we left, I bookmarked this fun post I found on Thrillist: NOLA’s Top Bartenders Reveal the City’s Best Everything. I’d take a look at it now and again throughout the trip. Spitfire is a tiny little coffee shop with just a handful of stools. I’m thinking it’s more of a grab and go sort of place. But the special menu intrigued me! What? They use bitters in their coffee? Peychaud’s Bitters originated in New Orleans, so you find the addition of bitters to countless cocktails in the city. But until now, I had never heard about them being added to coffee. You can even buy your own bottle of local artisan bitters. Rob and I decided to go with one of each of the specialty drinks and waited while the barista whipped them up for us. I never did get a taste of Rob’s little Mole Cortado. But I really dug the Hellfire Mocha. The habanero bitters were just subtle enough to give it a bit of heat without being overpowering. It was a chilly morning, so this was a perfect way to warm us up. Next time we are in N’awlin’s, I’d love to try Merchant, the other place recommended for best coffee. I love independent coffee shops! Whatever you do, break out of your comfort zone and try something different. How do you prefer your coffee? Do you ever change it up? Pingback: Commander’s Palace: An Experience | Season It Already! Pingback: New Orleans: Home of the Cocktail | Season It Already! Pingback: NOLA: Sports, Art, Music | Season It Already! Pingback: Nola Eats: The Best & Worst | Season It Already! Pingback: NOLA: Irish Pubs & Dive Bars | Season It Already! Pingback: NOLA: The Best of the Eating 2015 | Season It Already! Pingback: The Best Burger in New Orleans | Season It Already! Pingback: In Italian, Domenica means “flight canceled,” right? | Season It Already! Pingback: New Orleans: Happy Hour – The Way to Go | Season It Already! Pingback: A Little Creole & Cajun in MN! | Season It Already!